Garden Bytes from the Big Apple announces our first photo contest: culinary herbs in the garden. Chives (Allium shoenoprasum) in a community garden in Riverside Park, NYC. I use both the flowers and the chopped leaves in omelets and the dried flowers to decorate an allium themed summer hat. We two Ellens are appreciative eaters and we're especially fond of cooking what we grow. We wouldn't dream of having a garden without a healthy complement of culinary herbs. But these tasty plants aren't merely edible...some of them are downright gorgeous. Creeping Rosemary (Rosmarinus officinalis, prostrate group) in California. No originality here, I love rosemary on lamb. If you agree, and if you'd like to show us your most photogenic herbs, here's how you can enter. Post your best image to your own blog, website, or web gallery. Then, in the comment section for this post, post a link to your entry. If you're posting your image to a blog, please reference our contest with a link. Our talented and entirely impartial judge is Joe De Sciose. Joe is an award-winning photographer whose photographs have appeared in numerous Condé Nast, Hearst and Meredith magazines and books, as well as in print media for the New York Botanical Garden and The Brooklyn Botanic Garden. From 2003 to 2008, Joe was a Senior Staff Photographer at Southern Living Magazine. He was the sole photographer for Garden Guide: New York City (The Little Bookroom, 2002) and The Flower Gardener’s Bible (Storey Books, 2003), which was awarded a Garden Globe Award in 2004 by the Garden Writers Association for Best Photography for a Garden Book. Nasturtium, a spicy member of the watercress family, in a half barrel with geraniums. I use nasturtium flowers and leaves for a tasty garnish on anything from cold soups to desserts. 1) You may enter up to three photographs. 2) Include the names for the herb(s) in your image; extra credit if you give both the botanical and common names. 3) Write a brief caption (1 or 2 sentences) telling us your favorite way to use the herb in cooking. 4) Points given for light, composition, and originality. We're not looking for closeups; we want to see the herb(s) in a garden setting. 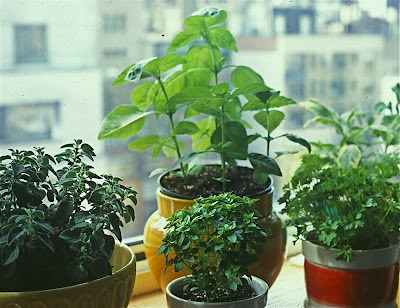 5) Remember, gardens can be indoors OR outdoors! This is NYC after all, and we don't all have outdoor gardens of our own. 6) We're not limiting this contest to New York City gardens because we have so many readers from away, but extra points will be given to photos showing herbs in an urban setting. 7) The contest ends at midnight on August 5, 2009. Indoor herb garden on my livingroom window sill: from left back row, oregano, basil, variegated sage, front row from left, tiny bush basil, and cilantro. We'll announce the winner in our Byte Now Column on August 12, 2009. And the lucky winner will receive a goody bag of prizes including: 'The New Book of Salvias' by Betsy Clebsch, a pair of garden gloves (women's size, sorry guys), and bypass pruners by OXO. ESP's images and captions (throughout this post) should give you a good idea of how to start! Bronze fennel (Foeniculum vulgare) at the Queens Botanical Garden, herb section. Use leaves, seeds, flowers or stems in corn bread stuffing. Calendula (Calendula officinalis) borders vegetable beds in George Washington's garden on a misty morning at Mt. Vernon. I use petals of calendula to garnish salads, and to color and flavor white rice. We plan to make this a regular feature at Garden Bytes. Hint: you might want to start photographing your photogenic pets in the garden. Meow. And we have you to thank for making that quiet 6am possible! Great tip for garden photography. Find a way to enter the garden before the hordes of tourists. Oh my goodness, you've set a very high standard! I'll have to go and have a very careful look at my herb patch. Most of mine are looking a bit crispy round the edges (and not in a good way). Victoria, how do your neighbor's herbs look? I wanna play, where do I send my photos? Since you're a blogger, I imagine it would be easiest for you to post up to three images in a post of your own, then come back here to GardenBytes and leave a comment with a link to your post. We'd also like it if you'd include a link to our contest post in your entry post. Hope that's clear, and thanks for playing! I posted an entry on Facebook so you can find it there on Jennifer Platt Hopkins wall. I posted my three photos and a little blurb about your contest. I've promo'd on Facebook and Twitter for ya. Hello from the top floor of a brownstone in Brooklyn, where the sunny edge of my tiny terrace is dedicated to herbs. Here are two of my pictures, and if am intrepid, there will be a third, shortly. Jayme, that is a well-stocked herb garden! And FYI, we enjoyed something very similar to your cilantro pesto grilled shrimp on the 4th of July. Marie, how great to hear from you. Love that aerial shot; it just goes to show what you can accomplish in a small, urban space. P.S. I have a huge crush on Don Estorbo. Here are pictures 2 and 3 - I deleted the old #2 from that post! Has this competition been canceled? Not at all! We've had a small delay from our judge (sorry about that) but should be able to announce a winner soon. Sorry to keep you waiting.